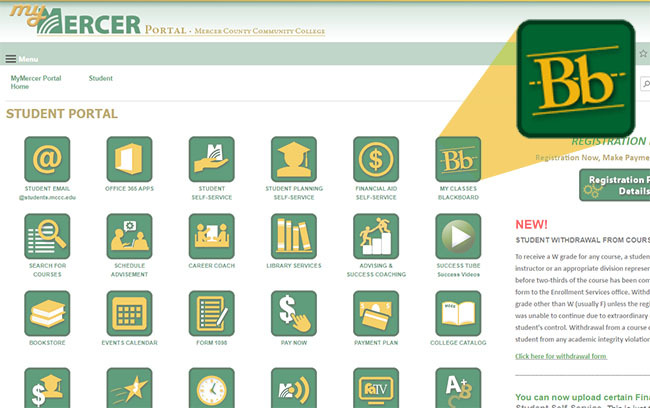 Log in once from MyMercer and access ALL your MCCC services including Blackboard, MercerMail, Registration, and more from a single location! Go to MyMercer and log in with your student credentials. Once you've logged in, you'll see your Blackboard courses listed in the "My Classes" section of the page. Just click on a course name, and you'll be taken to that course in Blackboard. Log in using the same credentials that you use for the MyMercer portal and other MCCC services. The Internet, computers, and independent study open alternate pathways to college. If you are highly motivated and enjoy working independently, virtual learning empowers you to decide when and where learning fits into your busy schedule. To discover what it's like to be an online student, click on the image below to play the Online Learning Adventure. You'll have unlimited attempts to play this game that navigates through a series of questions about the online learning experience. We recommend using Google Chrome for this game. Fully-online classes are offered entirely online, although sometimes you will be asked to take exams in the Testing Center or another approved educational site. Please refer to the class syllabus for information concerning on-campus proctored exams for the individual courses. Note: If you are an out-of-state student taking an online class and the class requires a proctored exam, you will be responsible for talking with the faculty member and arranging a proctored agreement with another educational institution or public library. Hybrid classes consist of both face-to-face and online lessons. With a hybrid class, students meet on campus half the time, and complete the other portion online. A majority of faculty will use the Blackboard learning management system to supplement the traditional face-to-face classroom by posting syllabi, handouts and other important information online. MercerOnline's mission is to advance a quality elearning experience to students seeking to earn degrees and other credentials that are valued by both transfer institutions and employers. MercerOnline initiatives will. Serve all faculty interested in education technology integration. Collaborate with academic divisions, committees and other professional units campuswide to provide instructional technology expertise and support for online and oncampus courses. Collaborate with the Instructional and Professional Improvement Committee (IPIC) and other campus-wide professional development priorities to provide training and support to users of instructional technology and multimedia in online and on-campus courses. All courses for Business Studies - management, Criminal Justice - corrections, and Liberal Arts programs may be taken entirely online (as well as by traditional classroom instruction). MercerOnline is staffed Monday through Friday, 8:30 a.m. to 5 p.m. (EST). If you have any questions regarding distance learning, or are in need of technical assistance, there are multiple ways to reach us. Or Tell Us How We Can Help!